Fisheries managers began trapping endangered Snake River sockeye salmon from Lower Granite Dam Monday and transporting the fish to Eagle Hatchery in Idaho as river managers struggled to keep the river cool. As of Wednesday this week, just five fish had been captured and transported. On Monday, managers trapped one sockeye and four on Tuesday, as most of the returning Snake River sockeye, expected to be one of the largest runs in recent history, are failing to show up at Lower Granite. After exceeding the temperature threshold last week, the U.S. Army Corps of Engineers has been struggling to keep water in the tailwater at Lower Granite Dam below the 68 degree Fahrenheit threshold, which was set by a NOAA Fisheries biological opinion in order to maintain cooler water temperatures in the lower Snake River while adult chinook salmon and sockeye salmon migrate. Sockeye are listed as endangered under the U.S. Endangered Species Act. The temperature in the dam's tailwater rose above 68 degrees for the first time this year July 6 when it went to 68.04 degrees. It continued to rise to 69.77 degrees July 8, but the Corps was able to drop the water temperature to below the threshold by the weekend by increasing flows from Dworshak Dam on the North Fork of the Clearwater River, a tributary of the Snake River. The warm water is slowing the sockeye migration. 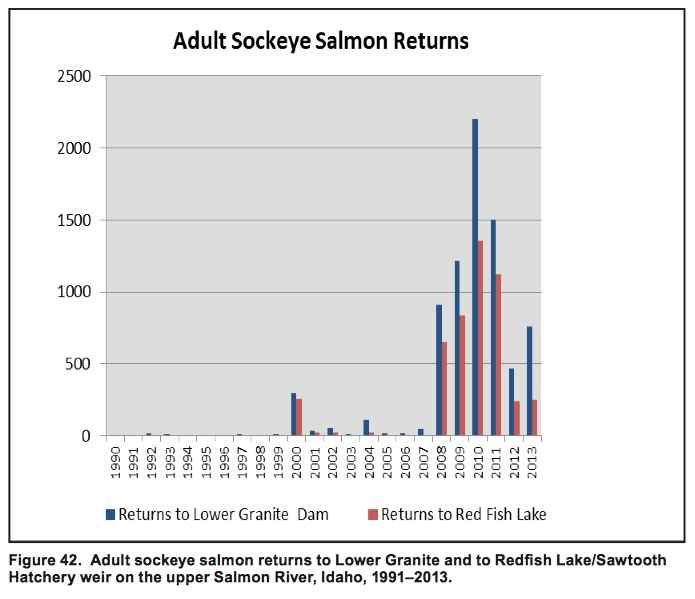 While 810 sockeye passed Ice Harbor Dam on the Snake River, which is 145 percent of the 10-year average, only 733 of the fish passed Lower Monumental Dam, 499 made it past Little Goose Dam and just 34 have made it to Lower Granite Dam, the most upstream of the four lower Snake River dams, said Paul Wagner of NOAA Fisheries at this week's regional Technical Management Team meeting. "Clearly the fish are stressed and in rough condition," he said. The BiOp, he added, has an emergency provision that allows fisheries managers to begin the transport program. Trapping of the fish is four hours each day. Idaho had requested the trap and hall operation for the sockeye and NOAA Fisheries issued a letter of concurrence responding to that request, Wagner said. "This action had broad co-manager support and we determined this action was consistent with provisions of the Section 10(a)(1)(A) permit that NMFS had issued to Idaho Department of Fish and Game for operation of their Snake River Sockeye Salmon Hatchery Program and the NMFS FCRPS BiOp," he said. "The emergency determination was made to allow operation of the Lower Granite adult trap at temperatures that exceeded the Fish Passage Plan's temperature criterion of 70 degrees F," Wagner continued. "RPA action 9 of the FCRPS BiOp allows operation of fish facilities outside of normal specifications due to unexpected events. The extreme temperatures that occurred at such an early date this season exceeded expectations." Pumps had been installed at Lower Granite Dam to draw water from deep in the forebay to cool water at the adult trap. The pumps helped to lower temperatures, but still, at times, exceeded 70 degrees. Additional modifications are planned to provide even deeper, cooler water that will be in place in for the 2016 migration season. Lower in the Columbia River, the sockeye are stalling as well and some are dying at Bonneville and The Dalles dams. Still, the sockeye have done well this year, with 486,000 passing Bonneville Dam. Most of those fish are headed up the Columbia River to the Okanagan River, Wagner said, but they've stalled at Wells Dam because the Okanagan River is so hot. The sockeye that are in the lower river are pulling in at cool spots, such as Drano Lake on the Washington side of the Columbia River. According to Steve Hall of the Corps' Walla Walla District, the temperature in the Lower Granite tailwater early Wednesday morning was 65 degrees, but he expected the temperature to go up later this week as air temperatures are expected to again rise above 90 degrees Fahrenheit and sunny skies will increase solar radiation. He suggested to TMT managers to release more water from Dworshak Dam beginning Wednesday evening, increasing flows from the dam's 7,500 cubic feet per second up to full powerhouse flows, which are around 9.4 kcfs to 9.6 kcfs, in order to get the sockeye past the dam as soon as possible. The water would reach Lower Granite Dam in 72 hours, just in time, he thinks, to keep the water cool enough to maintain the temperature buffer (66.5 degrees to 68 degrees) salmon managers desire. In an attempt to also cool the pool just downstream of Lower Granite to Little Goose Dam, the Corps turned off the removable spillway weir at Lower Granite and is using power house number one, which is next to the fish ladder at the dam. That, he said, will keep the colder water closest to where the fish enter the ladder and it will put colder water down through the dam. Hall explained that Dworshak water is very cold and naturally stratifies. The water at five to ten meters, he said, is very cold. Bringing water over the RSW brings water to the surface and it heats up in the sun. As a result, the RSW has a detrimental effect on the water temperature downstream, while putting water through the powerhouse cools the water downstream. There is a price for using water now for the sockeye, but its best to help with "struggling sockeye passage," Hall said. Computer models by the Corps show that if flows from Dworshak remain at the current 7.5 kcfs through July, then a constant 7.5 kcfs would be available in August (see the model run). If flows rise to full powerhouse (about 9.6 kcfs) through July, then just a little more than 6 kcfs would be available through August. At 50 percent maximum spill (about 11.6 kcfs), then about 5.3 kcfs would be available through August. At gas cap spill of over 13 kcfs, about 4.3 kcfs would be available through August.